Welcome to San Antonio, Richard! After a rather lackluster first season with the Spurs, Richard Jefferson made his presence felt in a positive way, posting 19 points and seven rebounds in the Spurs’ impressive 102-88 win in Dallas last night. It was the kind of performance that the Spurs were expecting on more of a regular basis from the 29-year-old swingman, but after coming over in a trade from Milwaukee, Jefferson averaged just 12-4-2 on the season. But he did play pretty big minutes (31.1 per game) and shot pretty well from the field (47%). Digging a bit deeper, from his player page at 82games.com, he was a member of each of the Spurs’ top 20 five-man units and he outproduced his opponent by 1.6 in terms of PER. It’s tough for Jefferson to score consistently seeing as that he’s the fourth option when Tim Duncan, Manu Ginobili and Tony Parker are on the floor as well. To put his game into perspective, Jefferson scored 19 or more points just 11 times this season in 81 games. And his fine performance couldn’t have come at a better time. Game 2 is so important to the road team when they lose Game 1. A win completely shifts the momentum of the series heading back home, while a loss would have put the Spurs’ playoff chances on life support. The NBA offseason is by no means over, but the lion’s share is behind us, so it’s a good time to take a look back at a few of the…um…let’s say “questionable” decisions of the summer. Here are my Top 10, in no particular order. Feel free to add to the list if I missed something. 1. Trevor Ariza plays spiteful hardball…and loses. Let’s get this straight — the Lakers offered Ariza the same deal he was getting on the open market, and he refused since the Lakers could have offered more, but didn’t? Um, okay. David Lee (the agent, not the Knicks forward) says that Ariza wanted to go somewhere where he’d be “appreciated.” Lee overestimated the market for his client, and the Lakers quickly moved on to acquire Ron Artest. Now instead of playing for the world champs, Ariza is stuck in Houston on a team that faces a very uncertain future. Lee now says that Ariza turned down a deal worth $9 million more, but still picked Houston. It sounds to me like he’s just trying to save face. 2. Grizzlies acquire Zach Randolph. Once the Clippers traded for Randolph (and his toxic contract) last season, I thought the bar for NBA general managers had hit a new low thanks to Mike Dunleavy and his wily ways. But Dunleavy proved that he wasn’t the dumbest GM in the league when he convinced the Memphis Grizzlies to take on the final two years Randolph’s contract at the tune of $33.3 million. Remember that $25 million or so of cap space that the Grizzlies were going to have next summer? Yeah, that’s down to about $8 million with this brilliant move. Just when it looked like Chris Wallace was going to rehab his image after the Pau Gasol trade — Marc Gasol panning out, trading for O.J. Mayo — he goes and does this. Sigh. 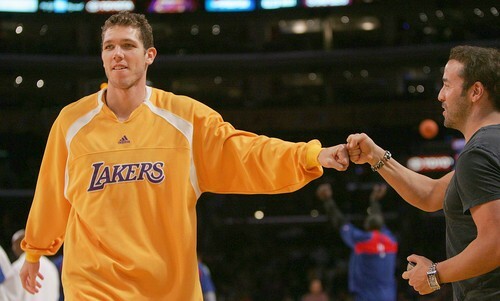 Memphis GM Gerald Wallace took a lot of heat for trading Pau Gasol to the Lakers. But if we’ve learned anything in the past few days, it’s that Wallace was simply a man ahead of his time. Regular readers know I’m a Bucks fan, and I spent the last couple of days grumbling on the Sports Bubbler message boards about how we didn’t get anything in return for Jefferson, who is still a pretty good player. When Wallace traded away Gasol, at least he got Javaris Crittenton (who was considered a prospect with upside at the time) and Pau’s brother, Marc, who turned out to be a productive center for the Grizzlies. Then I wake up today to see that the Cavs and Suns have agreed to go through with that long-rumored trade that will send Shaq to Cleveland for salary cap relief. Who do the Suns get in return? A retiree (Ben Wallace), a bench player with a partially guaranteed contract (Sasha Pavlovic), some cash and a second round pick. This is the going rate for a Third Team All-NBA center these days. We knew that this summer had the potential to be a rough one for free agents, but it’s a little surprising to see that good players like O’Neal and Jefferson could be had for virtually nothing. Bucks owner Herb Kohl and Suns owner Robert Sarver realize that their clubs aren’t legitimate contenders, so they don’t see the point in paying the luxury tax just for the privilege of being knocked out in the first round of the playoffs. What kind of an effect these moves have on season ticket purchases remains to be seen. The bottom line is that if a team is willing to spend, there has never been a better time to acquire talent. You’re not going to get someone like Caron Butler, who plays for a (pretend) contender and has a reasonable contract, but you can get Jefferson, who is overpaid and is on a mediocre team that is up against the luxury tax. And the older the player, the more likely he’s available. Teams aren’t going to give up good players that are in their early- or mid-twenties because the plan is to rebuild before they’re over the hill. So who might be on the move for a bag of peanuts and some salary cap flexibility? How about Tracy McGrady, Baron Davis, Chris Kaman, Marcus Camby, Vince Carter, Tyson Chandler, Amare Stoudemire, Jermaine O’Neal, Michael Redd, Ray Allen or Rip Hamilton? Truth be told, a team like the Suns isn’t going to give the youngish Stoudemire away for cap flexibility alone. But as the price of a star goes down, the price of superstar goes down as well. It promises to be an interesting summer. Richard Jefferson to the Spurs? 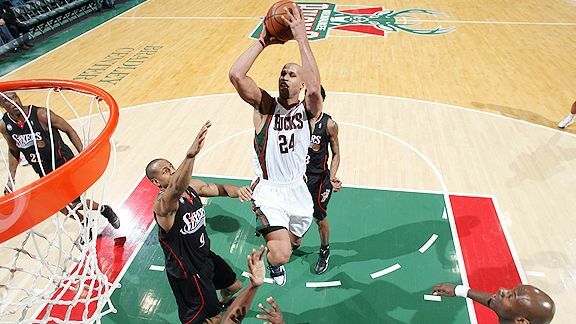 Chad Ford is reporting that the Bucks and Spurs have agreed to a swap that would include star swingman Richard Jefferson. 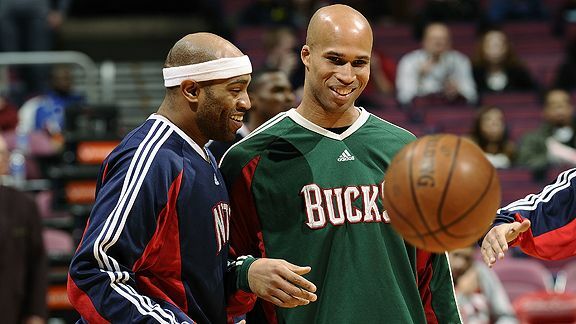 The Milwaukee Bucks agreed to trade Richard Jefferson to the San Antonio Spurs for Bruce Bowen, Kurt Thomas and Fabricio Oberto a Bucks source told ESPN.com. The two teams have agreed to the deal in principle. A trade call to make the deal official is coming later Tuesday. The move gives the Spurs a dynamic wing scorer to play alongside Tim Duncan, Tony Parker and Manu Ginobili. The Spurs had promised to make their team better this summer and adding Jefferson for role players should give them a huge shot in the arm. The Bucks incentive to make the trade is largely financial. Bowen, Oberto and Thomas are all in the last year of their contracts. The deal will clear $15 million off the books for the Bucks next season and give Milwaukee more flexibility for next year. It also saves them roughly $3 million this year. That may give the Bucks the wiggle room to sign one of their restricted free agents — either Charlie Villanueva or Ramon Sessions — next year. Largely financial? How about purely financial, Chad? For the Bucks, this is a straight salary dump. Jefferson has two years and $29 million remaining on his deal, and the Bucks are dangerously close to the luxury tax threshold. They have two pretty good free agents in Villanueva and Sessions that need to be addressed. It looks like they’ll have an extra $3 million this season to sign one or both to long-term deals. The funny thing is that I just saw an interview with Bucks GM John Hammond where he said that the franchise wasn’t in a position where they had to dump salary just to dump salary. Yeah, right. Talent-wise, the Bucks just lost a big piece in this trade, but if they’re able to retain Sessions and Villanueva, they might be able to recover some of that talent. The move may be a sign that the team is ready to give Villanueva starter’s minutes at one of the forward spots while playing defensive specialist Luc Richard Mbah a Moute at the other forward position. For the Spurs, if this trade does indeed go down, it will go a long way to getting the franchise back into serious contention in the West. Jefferson is an energetic defender who can hit the three and score on the break. He is just a good all-around player. The Spurs know that their championship window is closing, and if the do acquire Jefferson, they will prove they are willing to pony up to put a championship-caliber supporting cast around Tim Duncan. The economy is really starting to take its toll on professional sports, and the NBA is no different. Bad contracts are bad even when the economy is pumping, but they really stand out in tough times like these. So I decided to look through the payrolls team-by-team to try to identify the worst contracts in the NBA. I expected to list 15-20 names, but I ended up scribbling down 68. That’s right, there are no fewer than 68 bad contracts in the NBA. I didn’t include any of the players that are in the final year of their contracts because…well, what’s the point? They’ll be off the books in a few months anyway. Instead, I wanted to focus on those contracts that are going to haunt teams for years to come, so to be eligible, players have to have at least a year left on their current deals. It’s tough to compare someone making superstar money to an average, everyday role player, so I split these 68 contracts up into three groups: the Overpaid Role Players, the Not-So-Super Stars and the Injury-Prones. I will rank them from least-worst to most-worst with the thinking that I wouldn’t trade the player for anyone further down the list but I would trade him for anyone previously mentioned. So, for example, if a guy is listed #7 within a particular group, I’m not trading him for anyone ranked #6-#1, but I would think seriously about moving him for a guy that is ranked #8+. NBA trade rumors: Shaq to Cleveland?